Slow start to the season but heating up now! Florida was such an exceptional experience. Trips of such caliber ofter left me in fishing withdrawal. Some say that's a sign of a fishing addiction. I guess I am addicted after all. Before we left for Florida, I could sense that this would be an extremely cold winter. Hindsight tells me this is true indeed. Due to the early and suddenly cold weather, much of the lakes surrounding Toronto were frozen with safe ice by the time I returned home from sunny Florida. The prospect of great early icefishing helped to ease the fishing withdrawal a bit...or so I thought. I went fishing on Lake Simcoe the first available weekend. Unfortunately, a cold front spoiled our day and it was extremely slow. 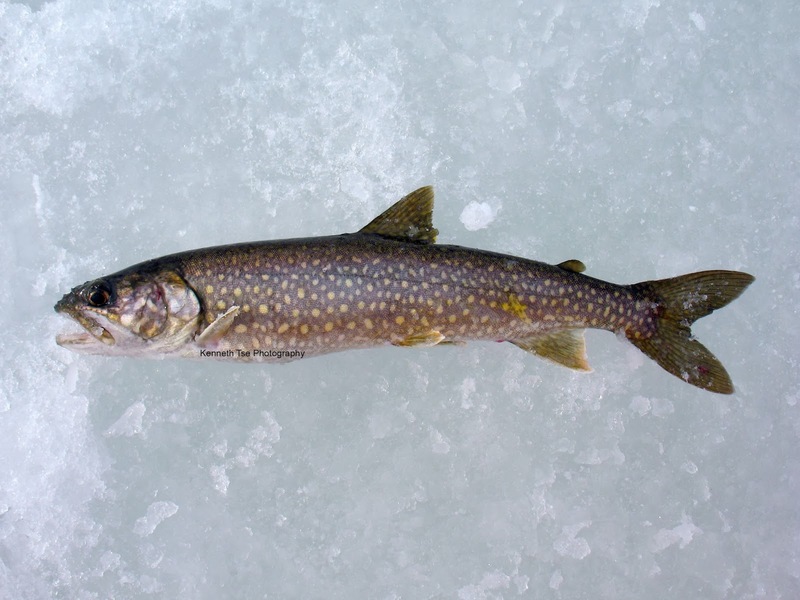 We hardly marked any Lake Trout and those that were detected by the sonar were in their grumpy, inactive mood. No amount of moving around to chase active fish seemed to help when they were simply not active. The following weekend, we were back again on yet another slow day. There was a bit of interest early in the morning, but the few Lake Trout that were willing to chase a lure 20-40 feet up the water column seemed to abandon the chase at the last second and sunk back quickly to sit tight on the bottom at 100+ feet of water. It was simply frustrating. We searched from 126 feet of water all the way up the sloping drop off to about 60 feet of water. There were no Lake Trout or Lake Whitefish. Toward the end of the day, we decided to fish in about 40 feet of water for a potential late afternoon Yellow Perch bite. Little did we know we punched out holes right on top of a very hungry Cisco school. 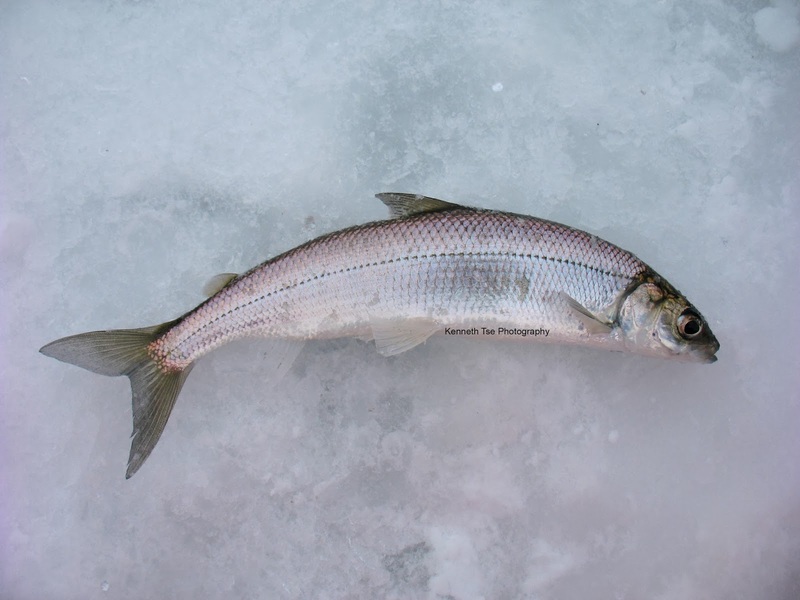 There were probably hundreds, if not thousands of Cisco just under the ice. 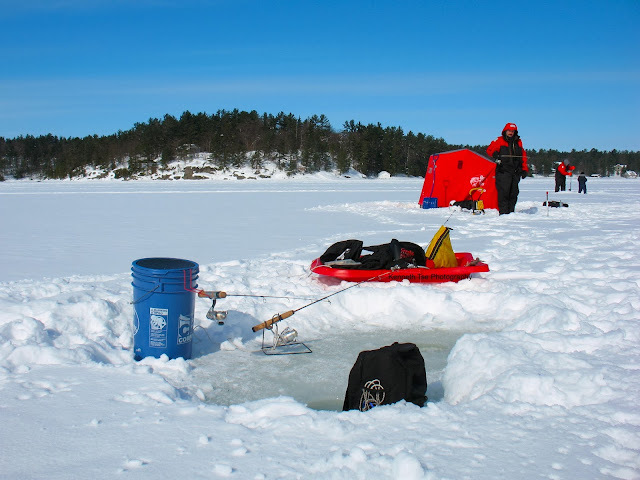 Our sonar was completely filled with fish marks from 0 to 30 feet below the ice over 40 feet of water. Our lures could not sunk to the bottom without being picked up by a Cisco on the drop. 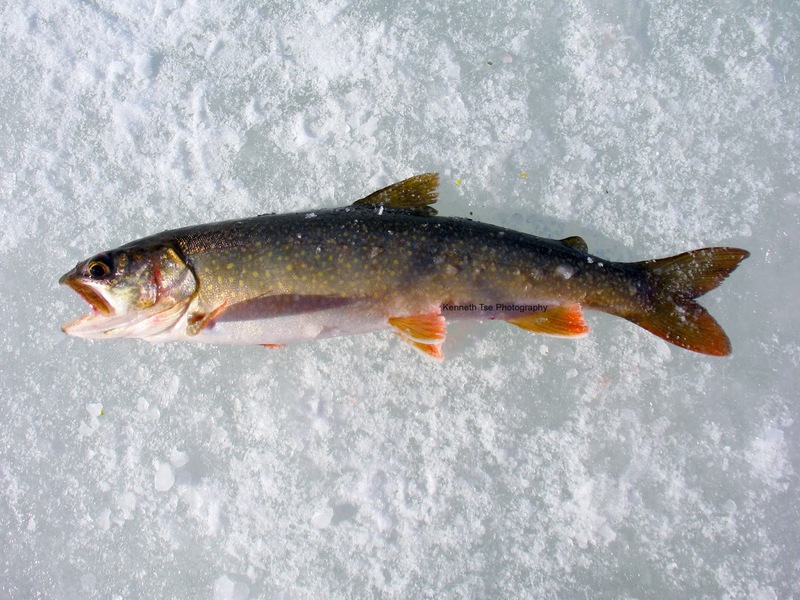 In fact, they were so aggressive some even chased the lures up the hole and almost jumped out onto the ice! I love the chrome side and iridescent purple back. They remind me of Ladyfish a lot. Just as aggressive and they form big schools as well. 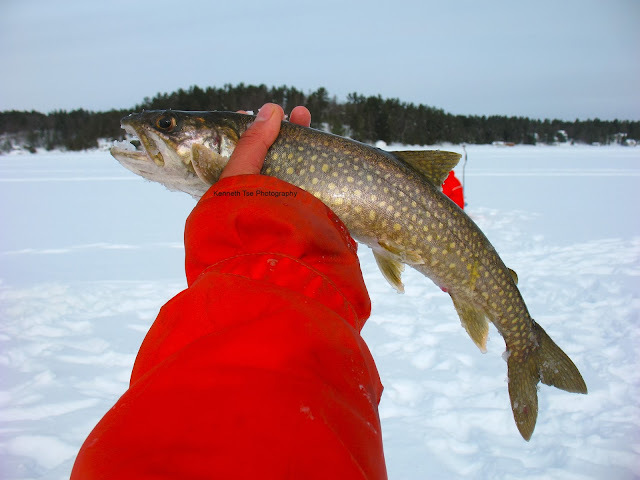 It was fantastic fun to drop your lure and see Ciscos swarmed the lure just under the ice. It was sightfishing on the ice at its best! The only caveat was that there was a close season for Cisco and all fish must be catch and release. After a little while, it simply felt pointless to catch them over and over again. The last weekend of January, I fished Lake Simcoe one last time. Sometimes I think anglers are masochists. I knew I was going to get skunked, but still I went back trying to disprove it. Well, I should have listened to myself and fished elsewhere. We caught a few Cisco again, but nothing really to write home about. Finally, I had enough of Lake Simcoe. It has not treated me well at all this winter. 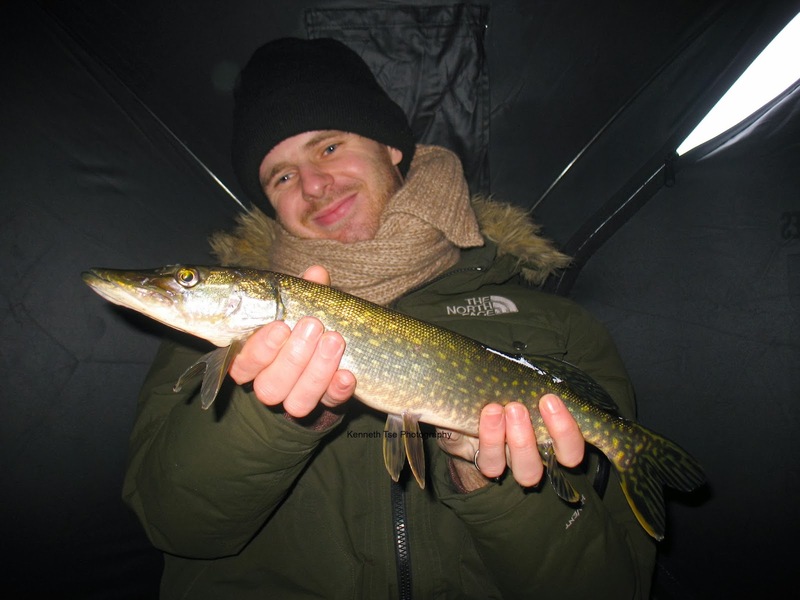 Instead, Anthony, who was a new arrival from France, and I decided to fish a favourite little lake of mine for Northern Pike. They don't grow too big here, but usually, they are pretty willing...usually. This was just the tough winter I've been having. We caught two Northern Pike after about 7 hours of fishing. My average day on this lake is about 5 Northern Pike. Something is just off. I did feel relieved that Anthony finally was able to catch a fish while icefishing. Now we're into the first weekend of February. I still wanted to chase Lake Trout, but simply not on Simcoe. When my friend Cuong suggested to fish a lake in Minden, I simply had to jump on it. Cuong had lost some big trout in the past, thus my game plan early in the morning was to fish big lures for big fish. There were active marks that chased my lures first thing in the morning, but they would abandon the chase just like the Simcoe fish. I made a tactical mistake and was adamant on fishing lures. The fish became inactive when a cold front moved through during mid morning and shut the bite down completely. Had I fished with live bait, I would have caught a fish, just like my friends Cuong and Mike did that day. 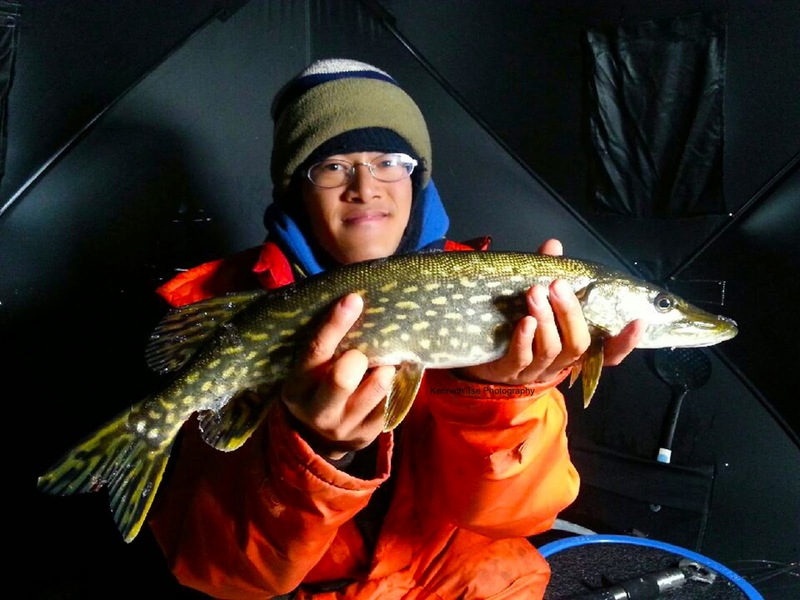 Cuong gave me a chance to redeem myself the weekend after on a lake in Muskoka area. The day was one of the nicest day I've fished this winter. It was warm and sunny and the stable pressure had presisted for a few days. Conditions looked prime and we were fishing a location known for quantity. Finally, luck started to turn around. The morning started slow since I was fishing a bit too shallow. After relocating a bit deeper near 50 feet of water, I started to catch a few Lake Trout. They were mostly small specimens but their willingness to hammer a well presented live bait made the day fun. I was also fishing with Mario and his son Kyle whom I had not fished with for a while. It was great to rekindle that fishing friendship again. I think I caught 5 or 6 Lake Trout that day. Some were steely grey. Most of them were around this size. Some had brilliant reddish fins! 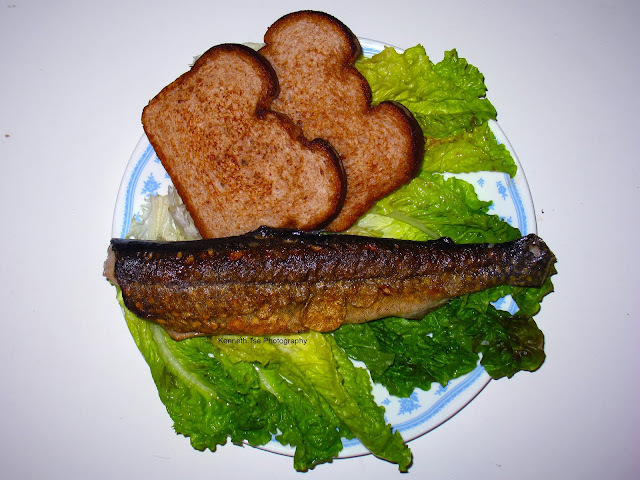 The thing I love best about these "northern" Lake Trout is their table quality, especially smaller 1-2lb pan-size fish. I always look forward to the meal after the day of fishing. Last Sunday, we went back to the same lake. Catch a handful of fish is about on par in my experience on this lake. The condition on Sunday did not look very prime. We had a warm spell with a rare winter thunderstorm that dumped 15-20mm of rain; followed by a cold front that dipped the temperature from 4C to -18C within the span of three days. I was expecting a slow fishing day...but sometimes the fish surprises you. The morning was a bit cloudy, but the fish did not seem to care. I started the day too shallow again. Once I relocated, the first bait dropped to bottom of that 50 feet of water was immediately met by a willing Lake Trout. For the next 4 drops, I caught 4 fish in a row. Last week, I learn that fish progressively moved deeper as morning turned to noon. It was important to stay on top of the fish migrating down this rapidly sloping shoreline. Once the fish stopped biting my rod at 50 feet of water, they began to visit my rod set at 55 feet of water. For the rest of the morning, I leap frogged my two rods deeper each time and thus was able to stay on the active bite all day. 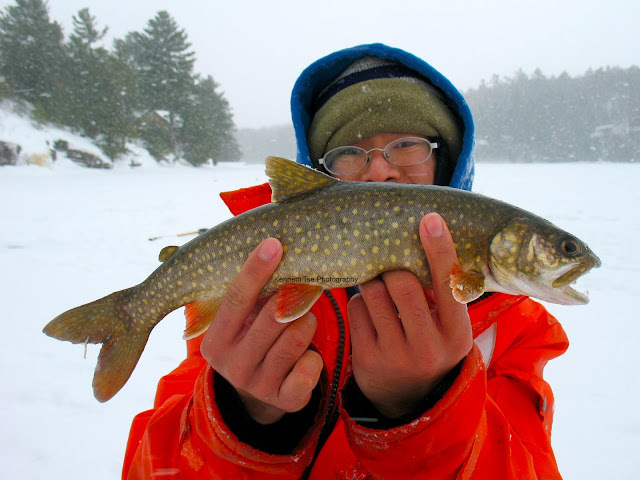 Despite having snow squalls conditions in the area, I had already caught over a dozen fish by 11am! Again, most of the fish were small, but the constant bite was fun, and some of them had fins there were as fluorescent orange as my floatation suit! During the midday, fish were found at the base of the drop in about 80-90 feet of water. They became much less active. However, if I slowly jig a gold spoon near the bottom, I could entice some curious fish into biting. It was a slower but steady pick through the afternoon until it was time to leave. The final count for the day was 20 Lake Trout iced, few few lost including a bruiser of a trout that turned my heavy rod into a semi circle, and quite a few short hits on the spoon that were missed. 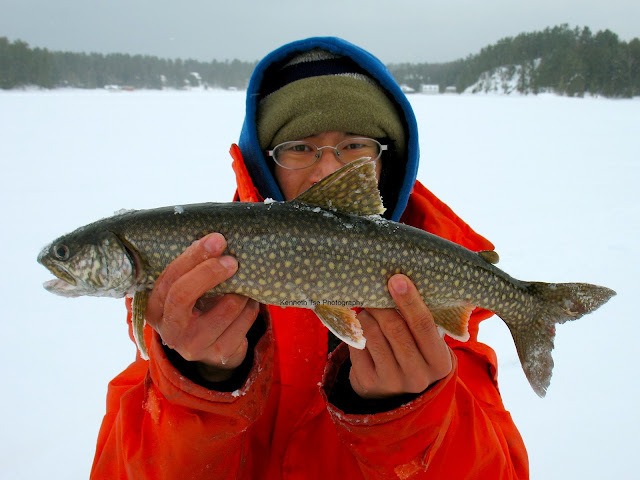 It was simply the best quantity day I've ever experienced fishing for Lake Trout. Most of the fish were release except for one, which became my tasty dinner last night. I'm going to explore a new spot in the area this weekend. Hopefully we can find a few willing players again.